On June 1, 2010, the NFB, along with the Shorefast Foundation and the Fogo Island Arts Corporation, will be celebrating the opening of a new e-cinema on Fogo Island in Newfoundland. This e-cinema (an all-digital community theatre) is the first theatre ever to exist on the island. It also marks the NFB's return to a community that 40 years ago, put the Challenge for Change program on the map. Challenge for Change was a program that allowed communities to use film and video to incite social change. By recording people talking about the issues, and then playing those recordings back to the community, everyone was able to get a global view of what the problems were and work together towards resolving them. The 9 films included in this playlist were part of the original Newfoundland Project, aka, The Fogo Island Project. They demonstrate, in a very concrete way, how the Challenge for Change program worked. The films were all directed by Colin Low, one of the founders of IMAX and one of the NFB and Canada's most famous documentary filmmakers. 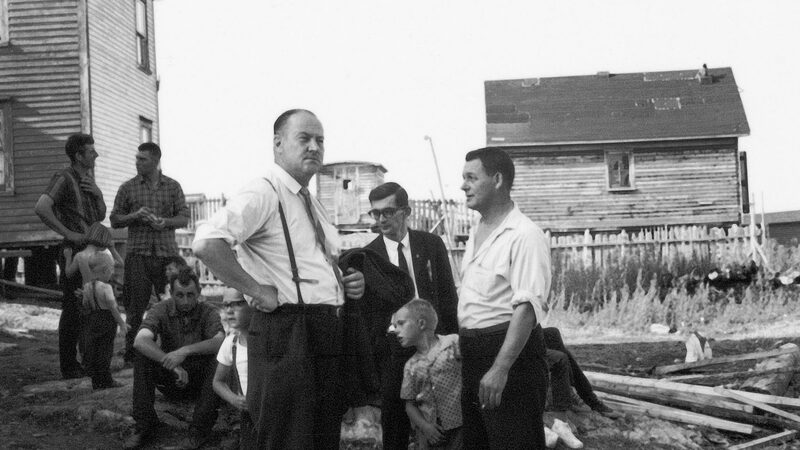 Now, in 2010, more than 40 years later, the NFB is returning to the Island to honour a longstanding commitment to the community. In addition to the opening of the e-cinema, we are working with the Shorefast Foundation and the Fogo Island Arts Corporation to offer media literacy workshops to the island's youth, providing them with the opportunity to tell their own stories, in their own way. We are also establishing a film residency partnership, offering artistic training to the Island's citizens in collaboration with 3 artist residents – Andrea Dorfman (Flawed), Bruce Alcock (Vive la Rose) and Yassine Ouhilal, who will be working with the NFB for the first time. In much the same way that the NFB began its relationship with the residents of Fogo Island, it is now continuing that tradition, encouraging their passion for the arts while simultaneously using film and video to bring about change, both to the community and the economy. This short documentary features Newfoundland fisherman Billy Crane, who speaks frankly on the state of the inshore fishery and how the lack of government support has contributed to the industry’s downfall. He is being forced to leave home to seek employment in Toronto. This film was made with the Challenge for Change program. Through the use of film as a catalyst for change, the people of Fogo Island, Newfoundland, voice some of their daily concerns. This film shows how one of the Islanders built a longliner with the help of his friends, overcoming the problems of financing, and of the lack of tools and government support.